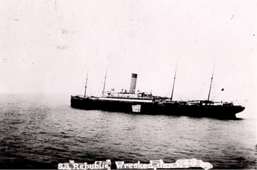 The RMS Republic was a luxury liner of the White Star fleet that had sailed from New York City on Friday January 22nd 1909 for a cruise to the Mediterranean. It was moving through a thick cold fog in the vicinity of the Nantucket lightship when the captain, Inman Sealby, and his crew heard a foghorn booming through the darkness. An unknown ship was speeding in its direction. The two ships exchanged horn blasts, with the idea that each would turn to starboard away from each other, thus avoiding a collision. As the blasts of the other ship came nearer, the Republic reversed engines and stopped. Instead of turning away, the unknown ship plowed on, right into the side of the Republic. The unknown ship turned out to be theFlorida, an Italian ship crammed with refugees from the devastating Messina earthquake that December. 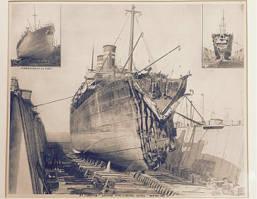 As she rammed the Republic, the Florida's bow tore a huge hole right down to the Republic's waterline and below. The Florida's bow crumpled with the blow, leaving an overhang that scraped across the Republic's main deck as she slid away to the Republic's stern, creating a devastation of crushed steel and tangled ropes in its wake. Two people on the Republic were killed instantly, and a couple of others severely injured. On the Florida, the sailors who had been in the bow were also killed, a total of six lives lost immediately. 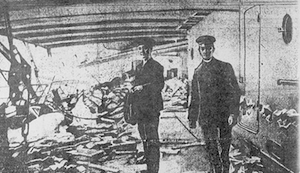 With the death of one of the severely injured later, altogether seven people died. That was to be the total of lives lost in this accident! Although the bows of the Florida, the ship that collided into the Republic, were crumpled, it was the more sea-worthy of the two ships, so Captain Sealby of the Republic had all his passengers and all but about 50 of his crew transferred to the Florida, a process that required four hours of backbreaking rowing by the Republic's sailors. Once the Republic's passengers were on board the Florida, this ship too began to take on water, and it was clear that a full-scale rescue at open sea was the only option. 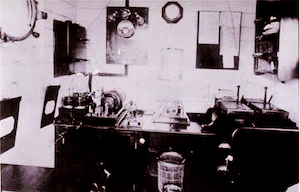 With some difficulty, the Republis's Marconi operator Jack Binns was able to reassemble his wireless apparatus in the cold and dark. HIs weak signal just managed to rouse the operator at the Marconi station at Siasconsett on Nantucket, Jack Irwin. Irwin, with his much stronger signal, was able to relay the message to ships in the vicinity. Eventually Binns was able to communicate directly with these ships. He then "talked" the White Star ship Baltic to the Republic's side, with the invaluable—indeed indefatigable—help of the Baltic's Marconi man, H.J. Tattersall, who, with his assistant Gilbert Balfour, was at his key 52 hours straight! Once the Baltic arrived, another backbreaking transfer by lifeboat shuttled all the passengers and the surplus crew of both the Republic and the Florida to the Baltic. This photo, taken from the Baltic by one of the Republic's passengers, shows the Republic with a tarp covering the gash in her side, drifting away from the rescue ships. The Florida, relieved of its burden, rode higher in the water and was able to limp to New York harbor. The Republic was not so lucky. Despite heroic efforts to tow it to shallow waters, it sank to 40 fathoms below the ocean south of Nantucket, while her captain and skeleton crew, including Jack Binns, were saved. The aftermath was not quite what the participants in the drama had hoped. There was never an official inquiry into the collision, possibly, or maybe even probably, because the Republic was carrying a treasure in gold bullion ~ knowledge of its loss might have precipitated a world financial crisis. Furthermore, the outcome was positive - so few lives had been lost - so people came to believe that all collisions of ships at sea would end that well. Consequently the shipping world came to erroneous conclusions, and did not carry out the necessary reforms that might have prevented the disaster of the Titanic three years later, or at least might have mitigated its effects. First among these erroneous conclusions was the idea that in subsequent collisions there would be enough time to ferry the passengers to another ship, as had happened with Republic-Florida collision. Consequently it was not necessary to carry enough lifeboats to accommodate all the passengers at once. By not having a full complement of lifeboats, shipping lines could pocket a considerable savings in equipment. As an added incentive, the appearance of a ship would be more pleasant, both from the decks of the ship and from shore, if there were fewer lifeboats blocking the view. And don't forget that lifeboats were a constant reminder of the dangers of ocean voyages. There was another time issue that led to the second conclusion, namely that a ship hit amidships above the water line would sink slowly, if at all, so a redesign of the hull to make it less vulnerable to side hits would not be necessary. Thus the Titanic was not equipped with a double hull above the water line. Third, wireless would always be effective in calling other ships to the site of an accident, so no changes in the way wireless was handled would be necessary. Although after the accident Jack Binns recommended that there be someone on wireless watch at all times, this recommendation was not heeded. If the Californian, which lay just to the North of the sinking Titanic, had had two people who could handle wireless communications, the one who was on duty would have heard the Titanic's distress call. Instead, Cyril Evans, the lone wireless operator on the Californian, had just gone to sleep when the distress call from the Titanic was sent out, so the Californian did not steam to the rescue until it was too late. These are but a few of the misconceptions derived from the Republic-Florida collision that set up the next series of large passenger liners for disaster. It would take the loss of as many lives in the Titanic sinking as were saved in the Republic sinking to wake the world up to the necessary safety precautions! This website is maintained by Jack Binns' granddaughter for all those who love the moments where technology and world history intersect. Copyright © Virginia U Lovelace. All rights reserved.